Taro stems are the young leaf stalks, or petioles, of the Taro plant. The plant most often known for its starchy tuber has much more to offer in its edible shoots, stems and leaves. The stems are typically from the young, new-growth leaves, though the stems of C. esculenta can be eaten when they are more mature. Often the young, as-yet unrolled leaves and stems are harvested together, and cooked together in vegetable dishes or soups. Taro stems are fibrous, so they must be peeled prior to preparing. The tough outer layer is removed to reveal a more tender stalk within. 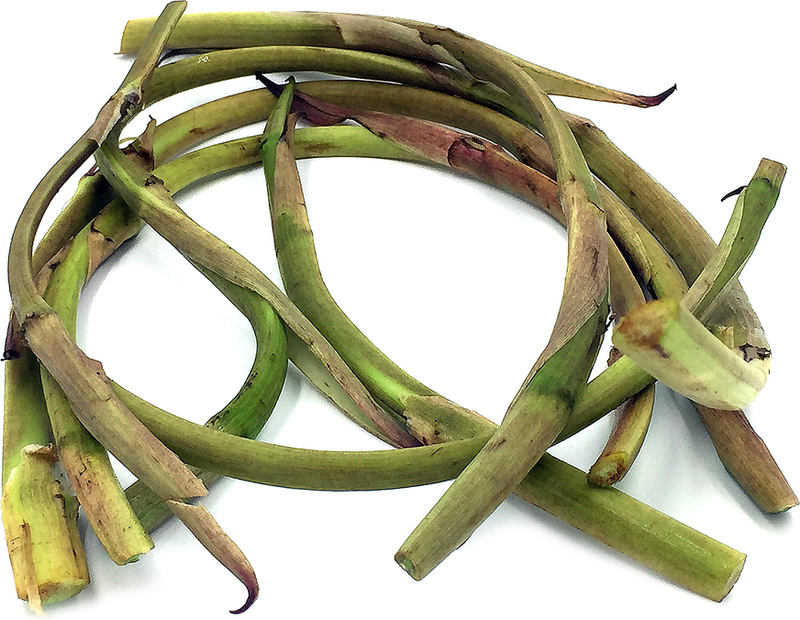 Taro stems have a slightly viscous texture reminiscent of okra, which is often a desirable texture in south Asian and Indonesia. Just like the leaves and corms, the stems contain an irritant called calcium oxalate, which can cause itchiness and swelling in the mouth and throat. Cooking the stems can remove the substance. Taro stems are available year-round. The young stems of the Taro plant, botanically classified as Colocasia esculenta, are harvested for use as a garden vegetable. Taro stems are most often found in Indonesia, Malaysia and throughout Southeast Asia. One variety of Taro plant, Colocasia gigantia, produces little to no tuber and is grown primarily for its leaf stems and extremely large, arrowhead-shaped leaves. There is some confusion as to which variety is most often grown for the stems, though the use of each is typically limited to geographic region. In Japan, Taro stems are called zuiki; in Cambodia, they are known as bac ha. In the Philippines, where Taro stems are often foraged from home gardens, the vegetable is called daludal and is referred to as the Philippines native asparagus. In Malaysia, taro is often referred to as “yam” and can cause confusion. Taro stems are high in fiber, making them easy to digest. The leaf stalks also contain Beta carotene, calcium and iron and are a good source of vitamins A and C.
Taro stems MUST BE COOKED to remove the calcium oxalate that can cause irritation to the mouth and throat. The stems can be blanched prior to preparation, though it is not necessary and they can be cooked along with the other items in a dish. The stems are often simply prepared with garlic, ginger and onions and topped with a little vinegar, for a sour element. Often mango or tamarind fruits are added to the dish. The leaf stalks are used in Cambodian and Vietnamese soups, or simmered in coconut milk in the Philippines. A popular dish from the Ilocos region in the Philippines is called Dinengdeng or inabraw, and includes Taro stems, string beans, bitter gourd, garlic and fish sauce, and is often served with a milk or other white fish. Taro stems can be served alone or with other vegetables in a sauté. Fresh Taro stems can be kept in the refrigerator for up to two weeks. Taro stems are most popular in the Philippines and are an essential ingredient in a dish called dinengdeng or inabraw. The stems are cut into bite-sized pieces and cooked in a broth along with other items typically found in a Philippine home garden. Squash blossoms, bitter gourd, moringa leaves and tomatoes are often found in dinengdeng. On two islands, Panay and Negros, Taro stems are called ‘Takway’ and are often simmered in coconut milk or vinegar and soy sauce. The Taro plant is native to Southeast Asia and its root or corm may very well be the first known cultivated vegetable. The plant is cultivated in swampy areas and flooded plains though it is also found in home gardens, in dry land and other areas that depend on periods of rainfall and irrigation. Taro root spread across the tropical regions of the globe with the help of explorers, reaching west to Egypt and Africa and east to the Pacific Islands and Hawaii. More than 10% of the world’s people use some variety of Taro as a food staple; however, that number is much smaller when it comes to the consumption of the Taro stems. Recipes that include Taro Root Stems. One is easiest, three is harder.